Too expensive to recommend for anyone and everyone, but could be perfect for the forgetful or at-risk. Zomm bills itself as a "wireless leash" for your phone. Obviously, that's nonsense, so what is it real-person language? It's a little Bluetooth dongle you attach to your keys (or your belt, with the included clip) that acts as a handsfree speaker, an alert to tell you've forgotten your phone, and a safety device. The main feature is probably the alarm that goes off if you wander too far from your mobile. Zomm makes a point of saying that you can customise the distance before it starts vibrating, flashing and making noise, but actually the options are basically 'short' and 'long'. We wish you could change the 'leash' length using a switch or button on the device itself, because you might not be bothered about wandering quite far from your phone in your office building, but don't want to get too far from a restaurant before you realise you've forgotten it. Regardless of that, it works. Stray too far from your mobile and you'll know about. As a tool to avoid forgetfulness, we can't really fault it. We think it would be even more useful if it could work both ways (so if you'd left your keys, your phone went off in your pocket), but that doesn't change the fact that it does exactly what it says it will. When you get a call, the Zomm will vibrate, flash and make noise. 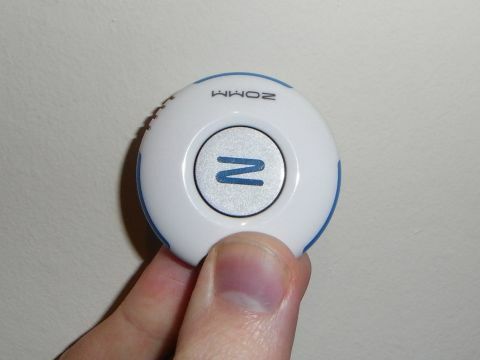 You can answer by pressing the Z button, turning the unit into a little handsfree kit. We found that it picked up voices really well, though they could become a little distorted. The speaker also suffers from some distortion, especially if you're on a weak line, and we found that it was easily drowned out. You can change the volume using your phone's volume options, but by the time you're holding your phone, you might as well just use that to take the call. The safety part of the Zomm worked well, too. Holding the button for a few seconds gets you a nice buzz, which indicates that you're about to get into alarm territory. Sure enough, an alarm will soon sound, and if you keep holding, it'll dial the emergency services. At £80, the Zomm is pretty expensive. However, panic alarms that can dial out in emergencies can easily cost that on their own, so when you factor in its call-answering capabilities and the 'wireless leash' feature, it's not too bad comparitively. Plus, if it saves your life, or even just stops you losing an expensive phone, it might start to look like a bargain. With all the ice and snow around currently, we can imagine Zomm would bring some peace of mind to older people especially, but it's still too much to spend for us to recommend it for everyone.